Your dog’s kisses may contain more than just love. Harmful bacteria causes tooth problems and pain and puts your dog at risk for life-threatening illness. An estimated 60 million dogs have gum disease by age 3. You can now identify the bacteria that commonly cause this problem at a very early stage. K9 Smiles is a simple oral swab test that is recommended yearly to help keep your dog happy and healthy. The test is covered by most pet insurance plans when part of your vet’s plan of care. Fournier D, Mouton C, Lapierre P, Kato T, Okuda K, Menard C. Porphyromonas gulae sp. nov., an anaerobic, gram-negative coccobacillus from the gingival sulcus of various animal hosts. Int J Syst Evol Microbiol 2001;51:1179-89. Hardham J, Dreier K, Wong J, Sfintescu C, Evans RT. Pigmented-anaerobic bacteria associated with canine periodontitis. Vet Microbiol 2005;106:119-28. Niemiec BA. Periodontal disease. Top Companion Anim Med 2008;23:72-80. Nomura R, Shirai M, Kato Y, et al. Diversity of fimbrillin among Porphyromonas gulae clinical isolates from Japanese dogs. J Vet Med Sci 2012;74:885-91. Senhorinho GN, Nakano V, Liu C, Song Y, Finegold SM, Avila-Campos MJ. Detection of Porphyromonas gulae from subgingival biofilms of dogs with and without periodontitis. Anaerobe 2011;17:257-8. Yamasaki Y, Nomura R, Nakano K, et al. Distribution and molecular characterization of Porphyromonas gulae carrying a new fimA genotype. Vet Microbiol 2012;161:196-205. 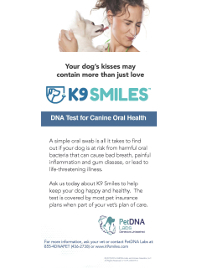 PetDNA Labs, a business of Access Genetics, offers the powerful K9 Smiles™ Early Warning Dental Test. It identifies harmful bacteria known to cause tooth problems and pain, and which could put your dog at risk for life-threatening illness. We use advanced DNA technology for this test with a methodology similar to what our OralDNA labs business has offered to dentists for over 8 years. 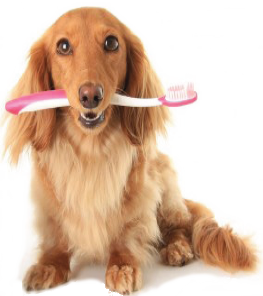 An estimated 60 million dogs have gum disease by age 3. You can now identify the bacteria that commonly cause this problem at a very early stage. 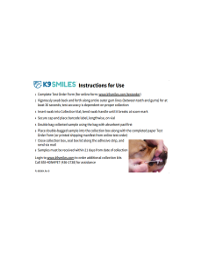 K9 Smiles is a simple oral swab test that is recommended yearly to help keep your dog happy and healthy. The test is covered by most pet insurance plans when part of your vet’s plan of care. K9 Smiles is an early warning dental test for dogs. We test for 3 pathogenic forms of oral bacteria known to cause periodontal disease. These bacteria are also associated with systemic illnesses such as heart, kidney and liver disease. 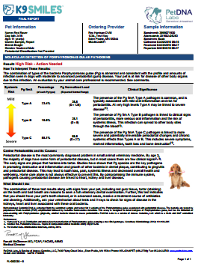 We have been helping thousands of medical and dental professionals use salivary diagnostics on humans for over 8 years – This is now available for your pet! Q: How does the testing process work? A:Our collection kit provides a simple oral swab to collect a sample, and a vial with preservative for transport. Our laboratory uses advanced DNA technology to identify and quantify three forms of harmful bacteria known as Porphyromonas gulae. The sample collected from your dog’s gumline is highly accurate and can provide information about risk at an early stage. This gives you the chance to proactively seek the right care for your dog. Q: When should I test? A: About 80% of dogs are estimated to have periodontal disease by age 3. It is most treatable at an early stage. We recommend testing beginning at 6 months to determine if your dog has emerging bacteria growth, and thereafter on an annual basis. Q: How do I order a K9 Smiles™ test? At Your Veterinarian’s Office: K9 Smiles™ can be ordered through your veterinary professional who will collect a sample during an office visit or provide pet owners with a collection kit to collect at home. Direct at Home: K9 Smiles™ can be ordered directly at www.k9smiles.com. A collection kit will be mailed to you. You then collect the sample and return it to us in the prepaid mailer. Q: How do I pay for K9 Smiles™ tests? A: Professionals set up an account and place a credit card on file. This is charged as samples are submitted. Single tests can be paid with a credit card if ordering online. Q: How do I get a collection kit? A: Collection kits are provided at no upfront charge to registered professionals when setting up an account. Collection kits are mailed to pet owners when the test is ordered and paid. Q: Is shipping and handling included? A: Yes, shipping and handling is included in the price of the K9 Smiles™ test. Q: How will my dog’s results be given to me? A: Your dog’s results will be e-mailed in an easy to read report that you can share with your veterinarian. Q: What do I do with my test result? A: We encourage you to discuss your dog's results with your veterinarian and have regular professional examinations. Your veterinarian can use the results to recommend appropriate care. If you or your veterinary professional have any questions, contact us today.